The true story of one family, caught between America’s two biggest policy disasters: the war on terror and the response to Hurricane Katrina. Abdulrahman and Kathy Zeitoun run a house-painting business in New Orleans. In August of 2005, as Hurricane Katrina approaches, Kathy evacuates with their four young children, leaving Zeitoun to watch over the business. In the days following the storm he travels the city by canoe, feeding abandoned animals and helping elderly neighbors. Then, on September 6th, police officers armed with M-16s arrest Zeitoun in his home. Told with eloquence and compassion, Zeitoun is a riveting account of one family’s unthinkable struggle with forces beyond wind and water. On moonless nights the men and boys of Jableh, a dusty fishing town on the coast of Syria, would gather their lanterns and set out in their quietest boats. Five or six small craft, two or three fishermen in each. A mile out, they would arrange the boats in a circle on the black sea, drop their nets, and, holding their lanterns over the water, they would approximate the moon. The fish, sardines, would begin gathering soon after, a slow mass of silver rising from below. The fish were attracted to plankton, and the plankton were attracted to the light. They would begin to circle, a chain linked loosely, and over the next hour their numbers would grow. The black gaps between silver links would close until the fishermen could see, below, a solid mass of silver spinning. Abdulrahman Zeitoun was only thirteen when he began fishing for sardines this way, a method called lampara, borrowed from the Italians. He had waited years to join the men and teenagers on the night boats, and he'd spent those years asking questions. Why only on moonless nights? Because, his brother Ahmad said, on moon-filled nights the plankton would be visible everywhere, spread out all over the sea, and the sardines could see and eat the glowing organisms with ease. But without a moon the men could make their own, and could bring the sardines to the surface in stunning concentrations. You have to see it, Ahmad told his little brother. You've never seen anything like this. And when Abdulrahman first witnessed the sardines circling in the black he could not believe the sight, the beauty of the undulating silver orb below the white and gold lantern light. He said nothing, and the other fishermen were careful to be quiet, too, paddling without motors, lest they scare away the catch. They would whisper over the sea, telling jokes and talking about women and girls as they watched the fish rise and spin beneath them. A few hours later, once the sardines were ready, tens of thousands of them glistening in the refracted light, the fishermen would cinch the net and haul them in. They would motor back to the shore and bring the sardines to the fish broker in the market before dawn. He would pay the men and boys, and would then sell the fish all over western Syria - Lattakia, Baniyas, Damascus. The fishermen would split the money, with Abdulrahman and Ahmad bringing their share home. Their father had passed away the year before and their mother was of fragile health and mind, so all funds they earned fishing went toward the welfare of the house they shared with ten siblings. Abdulrahman and Ahmad didn't care much about the money, though. They would have done it for free. Thirty-four years later and thousands of miles west, Abdulrahman Zeitoun was in bed on a Friday morning, slowly leaving the moonless Jableh night, a tattered memory of it caught in a morning dream. He was in his home in New Orleans and beside him he could hear his wife Kathy breathing, her exhalations not unlike the shushing of water against the hull of a wooden boat. Otherwise the house was silent. He knew it was near six o'clock, and the peace would not last. The morning light usually woke the kids once it reached their second-story windows. One of the four would open his or her eyes, and from there the movements were brisk, the house quickly growing loud. With one child awake, it was impossible to keep the other three in bed. Kathy woke to a thump upstairs, coming from one of the kids' rooms. She listened closely, praying silently for rest. Each morning there was a delicate period, between six and six-thirty, when there was a chance, however remote, that they could steal another ten or fifteen minutes of sleep. But now there was another thump, and the dog barked, and another thump followed. What was happening in this house? Kathy looked to her husband. He was staring at the ceiling. The day had roared to life. The phone began ringing, today as always, before their feet hit the floor. Kathy and Zeitoun - most people called him by his last name because they couldn't pronounce his first - ran a company, Zeitoun A. Painting Contractor LLC, and every day their crews, their clients, everyone with a phone and their number, seemed to think that once the clock struck six-thirty, it was appropriate to call. And they called. Usually there were so many calls at the stroke of six-thirty that the overlap would send half of them straight to voicemail. Kathy took the first one, from a client across town, while Zeitoun shuffled into the shower. Fridays were always busy, but this one promised madness, given the rough weather on the way. There had been rumblings all week about a tropical storm crossing the Florida Keys, a chance it might head north. Though this kind of possibility presented itself every August and didn't raise eyebrows for most, Kathy and Zeitoun's more cautious clients and friends often made preparations. Throughout the morning the callers would want to know if Zeitoun could board up their windows and doors, if he would be clearing his equipment off their property before the winds came. Workers would want to know if they'd be expected to come in that day or the next. "Zeitoun Painting Contractors," Kathy said, trying to sound alert. It was an elderly client, a woman living alone in a Garden District mansion, asking if Zeitoun's crew could come over and board up her windows. "Sure, of course," Kathy said, letting her feet drop heavily to the floor. She was up. Kathy was the business's secretary, bookkeeper, credit department, public-relations manager - she did everything in the office, while her husband handled the building and painting. The two of them balanced each other well: Zeitoun's English had its limits, so when bills had to be negotiated, hearing Kathy's Louisiana drawl put clients at ease. This was part of the job, helping clients prepare their homes for coming winds. Kathy hadn't given much thought to the storm this client was talking about. It took a lot more than a few downed trees in south Florida to get her attention. "We'll have a crew over this afternoon," Kathy told the woman. Kathy and Zeitoun had been married for eleven years. Zeitoun had come to New Orleans in 1994, by way of Houston and Baton Rouge and a half- dozen other American cities he'd explored as a young man. Kathy had grown up in Baton Rouge and was used to the hurricane routine: the litany of preparations, the waiting and watching, the power outages, the candles and flashlights and buckets catching rain. There seemed to be a half-dozen named storms every August, and they were rarely worth the trouble. This one, named Katrina, would be no different. Downstairs, Nademah, at ten their second-oldest, was helping get breakfast together for the two younger girls, Aisha and Safiya, five and seven. Zachary, Kathy's fifteen-year-old son from her first marriage, was already gone, off to meet friends before school. Kathy made lunches while the three girls sat at the kitchen table, eating and reciting, in English accents, scenes from Pride and Prejudice. They had gotten lost in, were hopelessly in love with, that movie. Dark-eyed Nademah had heard about it from friends, convinced Kathy to buy the DVD, and since then the three girls had seen it a dozen times - every night for two weeks. They knew every character and every line and had learned how to swoon like aristocratic maidens. It was the worst they'd had it since Phantom of the Opera, when they'd been stricken with the need to sing every song, at home or at school or on the escalator at the mall, at full volume. Zeitoun wasn't sure which was worse. As he entered the kitchen, seeing his daughters bow and curtsy and wave imaginary fans, he thought, At least they're not singing. Pouring himself a glass of orange juice, he watched these girls of his, perplexed. Growing up in Syria, he'd had seven sisters, but none had been this prone to drama. His girls were playful, wistful, always dancing across the house, jumping from bed to bed, singing with feigned vibrato, swooning. It was Kathy's influence, no doubt. She was one of them, really, blithe and girlish in her manner and her tastes - video games, Harry Potter, the baffling pop music they listened to. He knew she was determined to give them the kind of carefree childhood she hadn't had. "That's all you're eating?" Kathy said, looking over at her husband, who was putting on his shoes, ready to leave. He was of average height, a sturdily built man of forty-seven, but how he maintained his weight was a puzzle. He could go without breakfast, graze at lunch, and barely touch dinner, all while working twelve-hour days of constant activity, and still his weight never fluctuated. Kathy had known for a decade that her husband was one of those inexplicably solid, self-sufficient, and never-needy men who got by on air and water, impervious to injury or disease - but still she wondered how he sustained himself. He was passing through the kitchen now, kissing the girls' heads. "Don't forget your phone," Kathy said, eyeing it on the microwave. "Why would I?" he asked, pocketing it. "So you don't forget things?" "You're really saying you don't forget things." "Yes. This is what I'm saying." But as soon as he'd said the words he recognized his error. "You forgot our firstborn child!" Kathy said. He'd walked right into it. The kids smiled at their father. They knew the story well. It was unfair, Zeitoun thought, how one lapse in eleven years could give his wife enough ammunition to needle him for the rest of his life. Zeitoun was not a forgetful man, but whenever he did forget something, or when Kathy was trying to prove he had forgotten something, all she had to do was remind him of the time he'd forgotten Nademah. Because he had. Not for such a long time, but he had. She was born on August 4, on the one-year anniversary of their wedding. It had been a trying labor. The next day, at home, Zeitoun helped Kathy from the car, closed the passenger door, and then retrieved Nademah, still in her carseat. He carried the baby in one hand, holding Kathy's arm with the other. The stairs to their second- floor apartment were just inside the building, and Kathy needed help getting up. So Zeitoun helped her up the steep steps, Kathy groaning and sighing as they went. They reached the bedroom, where Kathy collapsed on the bed and got under the covers. She was relieved beyond words or reason to be home where she could relax with her infant. "Give her to me," Kathy said, raising her arms. Zeitoun looked down to his wife, astonished at how ethereally beautiful she looked, her skin radiant, her eyes so tired. Then he heard what she'd said. The baby. Of course she wanted the baby. He turned to give her the baby, but there was no baby. The baby was not at his feet. The baby was not in the room. "Where is she?" Kathy asked. Zeitoun took in a quick breath. "I don't know." "Abdul, where's the baby?" Kathy said, now louder. Zeitoun made a sound, something between a gasp and a squeak, and flew out of the room. He ran down the steps and out the front door. He saw the carseat sitting on the lawn. He'd left the baby in the yard. He'd left the baby in the yard. The carseat was turned toward the street. He couldn't see Nademah's face. He grabbed the handle, fearing the worst, that someone had taken her and left the seat, but when he turned it toward him, there was the tiny pink face of Nademah, scrunched and sleeping. He put his fingers to her, to feel her heat, to know she was okay. She was. He brought the carseat upstairs, handed Nademah to Kathy, and before she could scold him, kid him, or divorce him, he ran down the stairs and went for a walk. He needed a walk that day, and needed walks for many days following, to work out what he'd done and why, how he had forgotten his child while aiding his wife. How hard it was to do both, to be partner to one and protector to the other. What was the balance? He would spend years pondering this conundrum. This day, in the kitchen, Zeitoun wasn't about to give Kathy the opportunity to tell the whole story, again, to their children. He waved goodbye. Aisha hung on his leg. "Don't leave, Baba," she said. She was given to theatrics - Kathy called her Dramarama - and all that Austen had made the tendency worse. He was already thinking about the day's work ahead, and even at seven- thirty he felt behind. Zeitoun looked down at Aisha, held her face in his hands, smiled at the tiny perfection of her dark wet eyes, and then extracted her from his shin as if he were stepping out of soggy pants. Seconds later he was in the driveway, loading the van. Aisha went out to help him, and Kathy watched the two of them, thinking about his way with the girls. It was difficult to describe. He was not an overly doting father, and yet he never objected to them jumping on him, grabbing him. He was firm, sure, but also just distracted enough to give them the room they needed, and just pliant enough to let himself be taken advantage of when the need arose. And even when he was upset about something, it was disguised behind those eyes, grey-green and long-lashed. When they met, he was thirteen years older than Kathy, so she wasn't immediately sold on the prospect of marriage, but those eyes, holding the light the way they did, had seized her. They were dream-filled, but discerning, too, assessing - the eyes of an entrepreneur. He could see a run-down building and have not only the vision to see what it might become, but also the practical knowledge of what it would cost and how long it would take. Kathy adjusted her hijab in the front window, tucking in stray hairs - it was a nervous habit - while watching Zeitoun leave the driveway in a swirling grey cloud. It was time for a new van. The one they had was a crumbling white beast, long-suffering but dependable, filled with ladders and wood and rattling with loose screws and brushes. On the side was their ubiquitous logo, the words Zeitoun A. Painting Contractor next to a paint roller resting at the end of a rainbow. The logo was corny, Kathy admitted, but it wasn't easy to forget. Everyone in the city knew it, from bus stops and benches and lawn signs; it was as common in New Orleans as live oak or royal fern. But at first it was not so benign to all. When Zeitoun first designed it, he'd had no idea that a sign with a rainbow on it would signify anything to anyone — anything oher than the array of colors and tints from which clients might choose. But soon enough he and Kathy were made aware of the signals they were sending. Immediately they began getting calls from gay couples, and this was good news, good business. But at the same time, some potential clients, once they saw the van arrive, were no longer interested in Zeitoun A. Painting Contractor LLC. Some workers left, thinking that by working under the Zeitoun Painting rainbow they would be presumed to be gay, that somehow the company managed to employ only gay painters. When Zeitoun and Kathy caught on to the rainbow's signifying power, they had a serious talk about it. Kathy wondered if her husband, who did not at that point have any gay friends or family members, might want to change the logo, to keep their message from being misconstrued. But Zeitoun barely gave it a thought. It would costa lot of money he said — about twenty signs had been made, not to mention all the business cards and stationary — and besides, all the new clients were paying their bills. It wasn't much more complicated than that. "Think about it," Zeitoun laughed. "We're a Muslim couple running a painting company in Louisiana. Not such a good idea to turn away clients." Anyone who had a problem with rainbows, he said, would surely have trouble with Islam. Zeitoun pulled onto Earhart Boulevard, though a part of him was still in Jableh. Whenever he had these morning thoughts of his childhood, he wondered how they all were, his family in Syria, all his brothers and sisters and nieces and nephews scattered up and down the coast, and those who had long ago left this world. His mother died a few years after his father passed on, and he'd lost a treasured brother, Mohammed, when he was very young. But the rest of his siblings, those still in Syria and Spain and Saudi Arabia, were all doing well, extraordinarily so. The Zeitouns were a high-achieving clan, full of doctors and school principals and generals and business owners, all of them with a passion for the sea. They had grown up in a big stone house on the Mediterranean, and none had strayed far from the shore. Zeitoun made a note to call Jableh sometime that day. There were always new babies, always news. He only had to reach one of his brothers or sisters — there were seven still in Syria — and he could get the full report. Zeitoun turned on the radio. The storm that people were talking about was still far down in Florida, moving slowly west. It wasn't expected to make it up the Gulf for another few days, if at all. As he drove to his first job of the day, the restoration of a wonderful old mansion in the Garden District, he turned the dial on the radio, looking for something, anything else. Standing in her kitchen, Kathy looked at the clock and gasped. It was all too rare that she got the kids to school on time. But she was working on it. Or planned to work on it as soon as the season calmed down. Summer was the busiest time for the business, with so many people leaving, fleeing the swamp heat, wanting these rooms or that porch painted while they were away. With a flurry of warnings and arm movements, Kathy herded the girls and their gear into the minivan and headed across the Mississippi to the West Bank. There were advantages to Zeitoun and Kathy running a business together — so many blessings, too many to name — but then again, the drawbacks were distinct and growing. They greatly valued being able to set their own hours, choose their clients and jobs, and be at home whenever they needed to be — their ability to be there, always and for anything relating to their children, was a profound comfort. But when friends would ask Kathy whether they, too, should start their own business, she talked them out of it. You don't run the business, she would say. The business runs you. Kathy and Zeitoun worked harder than anyone they knew, and the work and worry never ended. Nights, weekends, holidays — respite never came. They usually had eight to ten jobs going at any one time, which they oversaw out of a home office and a warehouse space on Dublin Street, off Carrollton. And that was to say nothing of the property-management aspect of the business. Somewhere along the line they started buying buildings, apartments, and house, and now they had six properties with eighteen tenants. Each renter was, in some ways, another dependent, another soul to worry about, to provide with shelter, a solid roof, air-conditioning, clean water. There was a dizzying array of people to pay and collect from, houses to improve and maintain, bills to deal with, invoices to issue, supplies to buy and store. But she cherished what her life had become, and the family she and Zeitoun had created. She was driving her three girls to school now, and the fact that they could go to private school, that their college would be taken care of, that they had all they needed and more — she was thankful every hour of every day. Kathy was one of nine children, and had grown up with very little, and Zeitoun, the eighth of thirteen children, had been raised with almost nothing. To see the two of them now, to stand back and assess what they'd built — a sprawling family, a business of distinct success, and to be woven so thoroughly into the fabric of their adopted city that they had friends in every neighborhood, clients on almost every block they passed — these were all blessings from God. How could she take Nademah, for instance, for granted? How had they produced such a child — so smart and self-possessed, so dutiful, helpful, and precocious? She was practically an adult now, it seemed — she certainly spoke like one, often more measured and circumspect than her parents. Kathy glanced at her now, sitting in the passenger seat playing with the radio. She'd always been quick. When she was five, no more than five, Zeitoun came home from work for lunch one day and found Nademah playing on the floor. She looked up at him and declared, "Daddy, I want to be a dancer." Zeitoun took off his shoes and sat on the couch. "We have too many dancers in the city," he said, rubbing his feet. "We need doctors, we need lawyers, we need teachers. I want you to be a doctor so you can take care of me." Nademah thought about this for a moment and said, "Okay, then I'll be a doctor." She went back to her coloring. A minute later, Kathy came downstairs, having just seen the wreck of Nademah's bedroom. "Clean up your room, Demah," she said. Nademah didn't miss a beat, nor did she look up from her coloring book. "Not me, Mama. I'm going to be a doctor, and doctors don't clean." In the car, approaching the school, Nademah turned up the volume on the radio. She'd caught something on the news about the coming storm. Kathy wasn't paying close attention, because three or four times a season, it seemed, there was some alarmist talk about hurricanes heading straight for the city, and always their direction changed, or the winds fizzled in Florida or over the Gulf. If a storm hit New Orleans at all, it would be greatly diminished, no more than a day of grey gusts and rain. This reporter was talking about the storm heading into the Gulf of Mexico as a Category 1. It was about 45 miles north-northwest of Key West and heading west. Kathy turned the radio of; she didn't want the kids to worry. "You think it'll hit us?" Nademah asked. Kathy didn't think much of it. Who ever worried about a Category 1 or 2? She told Nademah it was nothing, nothing at all, and she kissed the girls goodbye. Copyright © 2010 by Dave Eggers. All rights reserved. No part of this excerpt may be reproduced or reprinted without permission in writing from the publisher. 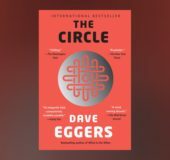 DAVE EGGERS is the author of twelve books, including The Monk of Mokha; The Circle; Heroes of the Frontier; A Hologram for the King, a finalist for the National Book Award; and What Is the What, a finalist for the National Book Critics Circle Award and winner of France's Prix Médicis Etranger. He is the founder of McSweeney's and the cofounder of 826 Valencia, a youth writing center that has inspired similar programs around the world, and of ScholarMatch, which connects donors with students to make college accessible. He is the winner of the Dayton Literary Peace Prize and is the cofounder of Voice of Witness, a book series that illuminates human rights crises through oral history. He is a member of the American Academy of Arts and Letters. His work has been translated into forty-two languages.